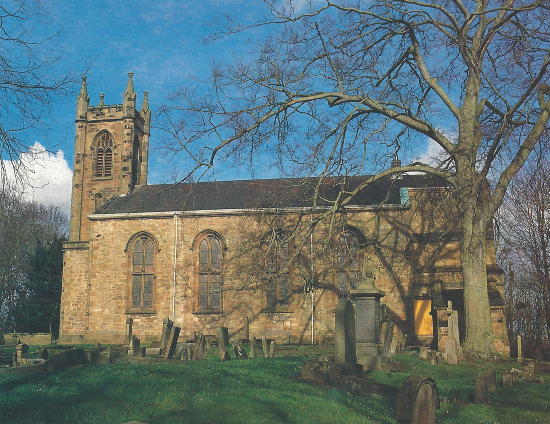 The records of the nation of Scotland carry the story of Cadder Church and Parish back to the middle of the 12th century. The Scots King David I instituted great reforms in Church and State before his death in 1153. His grandson and successor, Malcolm IV, made a grant of the lands of "Conclud, Cader and Badermonoc" to the Bishopric of Glasgow. This was confirmed by his successor, William the Lion. So there might have been a church before that, built near the old ruins of the Roman Camp on the Antonine Wall. But there definitely was a church building, and people worshipping there at Cadder, about the year 1150 A.D. Almost 850 years ago! As can be seen from the names of the known Pre-Reformation clergy at the back of this booklet, from the beginning links with the Cathedral of Glasgow were close. Many of the Sub-Deans were men of note. One at least, Andrew Muirhead, later became Bishop of Glasgow. Some of the nominal vicars may have held appointments in Rome, and the Appeals and Counter Appeals of which we have note suggest conflict between the priests doing the work locally and the holders of the office waiting for their stipends in Rome! From the Cathedral to the University of Glasgow, founded in 1451, the "Living" was annexed to the College of Glasgow and the University drew the teinds of the parish until 1821. It also possessed the right of patronage, i.e. appointing a minister, but this right was bought out by the Heritors and Parishioners in 1695. 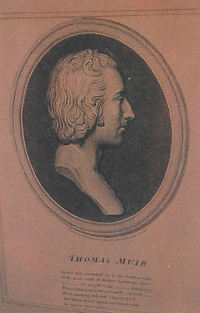 We are told that when the congregation of Cadder first sought to exercise their right to elect a minister there was a dispute with the University and Thomas Muir of Huntershill, at that time an Elder, made a spirited defence of the congregation's rights. After the great renewal of the Church in the Reformation of 1560 the first Reformed Minister was the Rev. David Cunningham who came from Lesmahagow in 1572. He also had charge of Monkland and Lenzie, covering both Kirkintilloch and Cumbernauld. Five years later he was consecrated Bishop of Aberdeen and this see-saw between Presbyterianism and Episcopacy was to continue for another hundred years. We know a fair amount about every minister since then. Men of learning, and men of great evangelical spirit, as well as men of very ordinary and even frail human failure. There was John Bell, whose manse was so ruinous he petitioned to rebuild, and was told to live in the steeple. Some were chased from the parish and others died honoured in the fulness of their years. The Minute Books of the Kirk Session of Cadder date from 1688 and the many volumes are fairly complete, though there is a great and unexplained blank from 8 May 1737 to 27 March 1791. The originals are lodged in Register House in Edinburgh, but we are fortunate in having complete photocopies for our own local use. 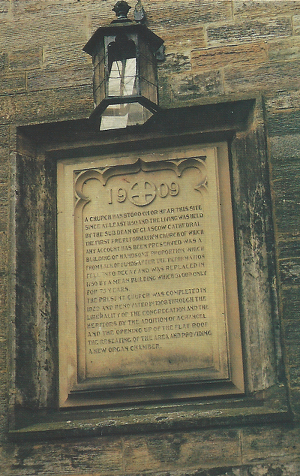 As the plaque on the East Wall, erected in 1909, informs us, the Pre-Reformation Church had to be replaced in 1750 and that in turn by the present building. This was designed by David Hamilton (1768-1843), one of the creators of early 19th century Glasgow, in Neo-Gothic style, built in 1825, and completed in 1829 by the erection of the tower through the generosity of the principal Heritor, Stirling of Cawder. In 1900 around 1,000 people lived in Bishopbriggs. Cadder Church served a wide country area and the farming, mining and quarrying communities looked to the old parish church for spiritual continuity and comfort. 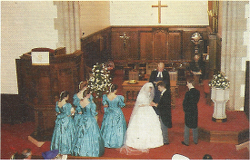 By the 1970s and 1980s we were one of the larger congregations in the West of Scotland, serving a bulging suburban community, with excellent facilities in South and North Halls, but focussed still on the lovely church in its early 19th century setting by the canal. At least three churches have been built on or near the present site of Cadder, and the area round about is likely to have been used for Christian burial for over 800 years. 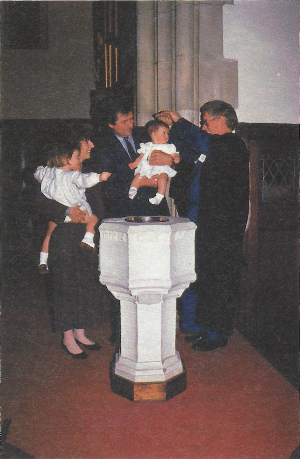 "It was the practice of the respectable families in the parish," says the Rev. Thomas Lockerby in the Second Statistical Account (1836), "to bury in the aisle or middle passage of the church, and some of them below their own seats." Other graves outside, over many centuries, remained unmarked. 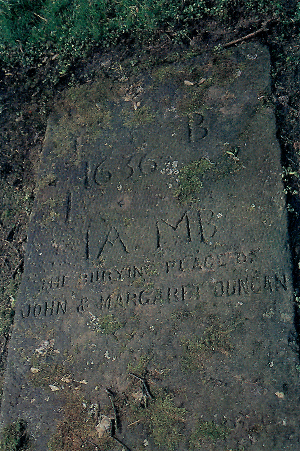 The earliest dated gravestones now are from 1636. When the present church was built in 1825 (tower 1829) it was the period of the "Resurrectionists". The years roughly between 1810 and 1830 were the boom years for these body-snatchers who robbed recent graves and sold the bodies to the doctor surgeons in the growing medical schools of Edinburgh and Glasgow for anatomical dissection. Eventually a series of murders committed by Burke and Hare in Edinburgh, to provide the surgeons with yet more bodies, led to public outrage and the Government passed an Act in 1833 regulating by licence the Schools of Anatomy. This is the background to the building in the Kirkyard of Cadder of the little "Watch House" and the existence of the "Mort-safe", as in many churchyards of the same period in Scotland. The mort-safe. which required several men to lift it, was placed over a newly interred coffin for several days then removed for re-use, while after a funeral a small group of relatives and church office-bearers would mount a guard for several nights in the watch house, often armed with an ancient blunderbuss to strengthen their courage. Cadder in 1900 had hardly changed as a place of worship since 1825, when our present building was built to the design of David Hamilton. In 1900 it was still a simple rectangular building with no chancel, a central pulpit, "horseshoe" gallery and hot air heating in ducts under the aisles. Hymns and Psalms were sung to the accompaniment of an Organ purchased in 1888 from St Pauls Episcopal Church. Buccleuch Street. The chancel window which we can still admire, filled the gable wall above the central pulpit. In 1905, when the first major improvements were encouraged by Rev. James Watt, the building of the present chancel caused the transfer of the Gardiner window and was the first step in the development of the church towards the 20th Century. New pews were installed downstairs with a wider spacing for a growing generation. New heating had recently been installed, the Organist had resigned after 14 years, and there were over 50 applications for the post. Mr. Watt was at great pains to reassure the congregation that the exterior of the church would remain unaltered and that the interior would be improved. At a Service in May 1908, George Buchanan of Gask (previously at Cawder House), placed a sealed casket into the new chancel arch. The casket - presumably still in position - contains copies of Life and Work, Church magazines, newspapers and coins of that date. 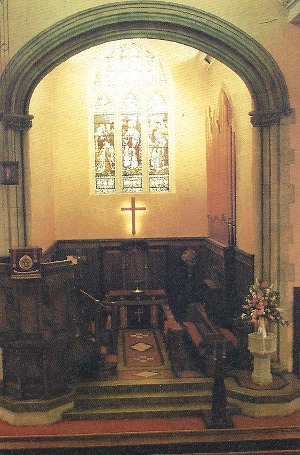 The church re-opened for worship in October 1908 with a flood of commemorative gifts which we can still enjoy today, The Stone Font, Oak Lectern, Brass Plates listing the Ministers, and still to be fitted at that time, the carved memorial pulpit. In 1911, Rev. James Watt died after 29 years in Cadder. The very fine stained glass window "Faith, Hope and Charity" was installed in 1914 as a tribute to Mr Watt where it remains facing the pulpit as an outstanding example of the work of young Alf Webster - later to lose his life in the 1914/18 war. 1914 was to be an epic year in the history of mankind. In that very year, Cadder Session decided to carry out fairly major alterations to the Gallery, in order to open up the central area of the church and allow space for the new window to Mr Watt. Hugh Reid of the North British Loco Company in Springburn, was a regular worshipper in Cadder at this time and was influential in the changes which were to take place. His suggestion for a new window in the side wall of the chancel, opposite the organ, was never carried out, but the memorial windows to his wife Marion Bell, is another superb example of the work of Alf Webster. Generous donations from Hugh Reid supported the Gallery work and the stained glass windows. The old "horseshoe" shaped gallery was cut back, and the current new gallery was built on top of the original timberwork. The carved oak front to the gallery incorporating Heritors' coats of arms was also gifted by Hugh Reid. It is interesting to note that the cost of the oak gallery front was £78 and the additional cost for the carved work was £62. Three carved shields remind us of the Heritors. Stirling of Kier & Cawder, Christie of Bedlay and Sprot of Garnkirk. All three played a significant part in the industrial development of Glasgow. Harriet Sprot in 1811 cut a sod to start work on the first railway line in Scotland (Glasgow to Garnkirk). After the '14-'18 war the congregation under its new Minister, Rev. Woodside Robinson. paid tribute to those lost in the Great War. The war memorial windows were dedicated in March 1921. 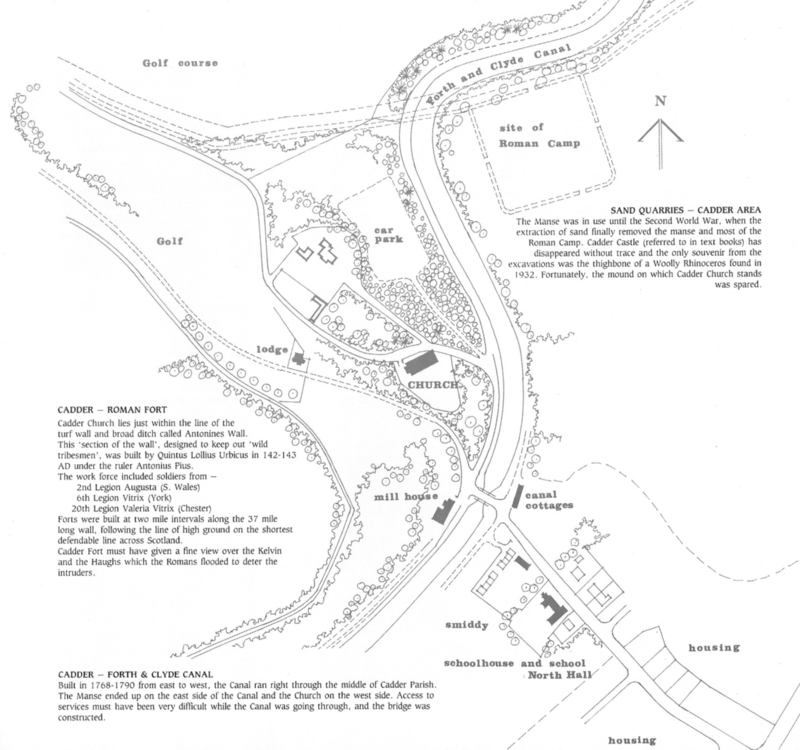 Life in the parish continued with 'missionary' activity in Mavis valley and Jelly Hill (the mining villages adjacent to the canal, near the Sports Centre). The Debating Society, and Dramatic Club continued to flourish with activities concentrated in the South Hall. The Organ in the Hall (South Hall) had to be overhauled and music was "restricted to piano and one or more violins". In 1922 the Organ was sold to St. Bride's Church Edinburgh. Session Minutes record that the Church Organ obtained in 1888, required fairly frequent attention and suffered many times from the leaking roof. It was finally replaced in 1957 with the present instrument, obtained from High Street Church, Dumbarton. Cadder Parish originally covered a large rural parish, and the services were regulated by times for milking and farm work. During the '2O's Rev. Woodside Robinson was minister of a parish extending from Lochgroy to Colston and Springburn, Mavis Valley to Blackhill and even included visits to New City Road. Reference in 1927 was made to "a great increase in population" in the Parish. Communion attendance had risen to 413 in 1929 when Alaisdair MacInnes was ordained and admitted following the retiral due to ill health of Mr. Robinson. The '30's were to prove a testing time for Cadder, as the effect of the 'general depression', coal strike and deteriorating personal relationships led to poor finances and attendances. In 1930, the membership totalled 700 with only 373 actually resident in Bishopbriggs. By 1939 310 members attended Communion, and the influx of new communicants was at a very low level. Contrast this with the service of David Brown who resigned in 1940 after 52 years teaching in the Sunday School. A breath of fresh air arrived in 1942 with the new Minister, Rev. Jas. Gordon. He was to enjoy the new manse at Balmuildy Road, the change to electric lighting at the Church and the restoration of the Hall from the A.R.P. In 1952 when he left for New Zealand, the roll had risen to 730, although it was noted that almost one third gave NO support to the Church. Rev. Brock Doyle rose to the challenge of the population growth, and the demands in assisting the blending of the traditionalists and the newcomers. Under his ministry membership rose to 816 with communion attendance p.a. at 77%. The organ was replaced in 1957 and the Session approved the replacement of the 'Samba Stop' at a cost of £20. Congregational growth continued under Rev. Douglas MacNaughton - placing a premium on hall accommodation - leading to the major extension of the (South) Hall in 1961. Cadder had seen a substantial growth from the 260 membership in 1825; 500 in 1908; 750 in 1928 and 1099 in 1962. The old Church building, its ministers and members have served well since 1825, and should have many years of service still to give. Recent years have seen the efforts required in a modern affluent society to create and sustain a living Church. Cadder has participated in the various campaigns "into the '80's", Parish visitation, membership reviews and has made many adjustments in the continuing process of providing a Church that welcomes and sustains. 1900-1990, ninety very varied years. The future success is still dependent, as ever, on the faithful support and attendance of the members. Chancel built in 1908 and basically unaltered till 1980. 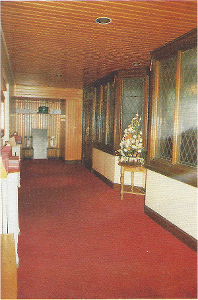 Pine panelled walls and choir pews. Central tile floor leading to Communion Table at rear. Oak pulpit and curved stair. Organ from Dumbarton, installed in 1957. Alice Gardner stained glass window in rear wall. During Communion services the tops of the choir pews were covered in white linen and occupied by the duty Elders. Wall panelling and memorial panels remain unaltered. Choir pews have been removed and substituted with oak chairs from the uniting churches of Springburn. Pulpit has been lowered slightly and moved to the left towards the vestry door. Main floor area of Chancel has been raised and extended in front of the Chancel arch with steps, incorporated to give an intermediate level. Communion Table now occupies a forward position under the Chancel Arch, giving an improved view during Communion services. The raised floor areas also enhance the services during weddings, baptisms, and children's services. 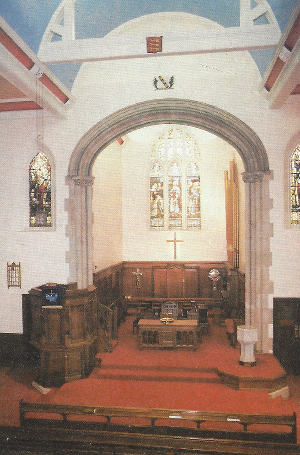 The vestibule was increased in size by the removal of a rear central pew and some side pews. The original leaded glass windows and doors have been built into a new screen enclosing the vestibule, and the additional space created, provides a generous meeting area with cloaks, display, etc. Three gold buckles on black sand. Three silver salmon with rings in their mouths. Three gold keys on a red ground. 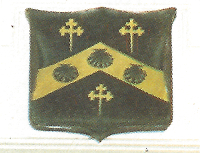 On a gold ground, a black St Andrew's cross between four black stars, and, on a black border at the uppermost part of the shield, three silver crescents. On a silver ground, a black unicorn's head and a ring separated by a black band. 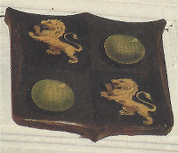 Quartered arms showing a black lion rampant - similar to the arms of Scotland but with different colours. 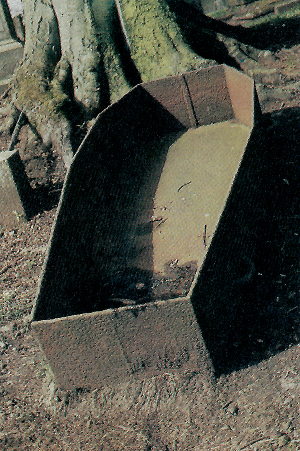 MACNEAL OF AUCHINLOCH Little is known of two remaining shields. 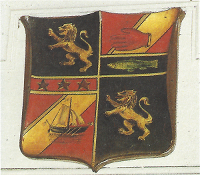 Quarter arms displaying the galley of Sam (and the Red Hand of Ulster). Two gold lions on black, three stars and fish. N.B. Emblazoning of arms is not accurate in all cases. as various painters engaged in decorating tile church have couched up tile arms on several occasions. Solid Stone font gifted by Marshall family in October 1908. Previous font was given to Father Charles Webb of St. Joseph's - Cardowan, Stepps, who wrote some time later to express his thanks and to say that the font was being very well used. Carved Oak table bearing the inscription: "This do in remembrance of me". The table was surplus to requirements in another Church, and was acquired many years ago by the late Rev. Douglas H.H. McNaughton. The table is thought to be from Dundas Street congregational Church, Glasgow. 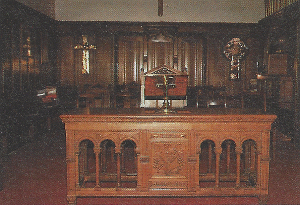 In 1980 following alterations to the Chancel, this table was found to be very suitable for the new position of the Communion Table in the area at the front of the Chancel. The Romanesque style of the table with its carved semicircular arches and columns provides an interesting contrast with the late Gothic windows, and a link with the Chancel arch and vaulted ceilings. 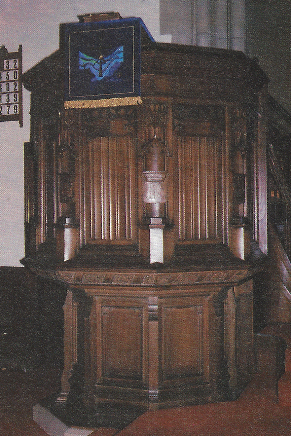 Gifted by the Brownlee Company in late 1908 the pulpit was not installed till March 1910. Constructed in 'Austrian Oak' to a design by Stewart & Paterson Architects and including carved decorative shields, 'linen fold' panelling and carved mouldings, it was 'preached in' by Rev. J. McGregor. Lowered in height when the galleries were removed in 1914, it was lowered again in 1980 when the alterations were carried out to the chancel. One of the treasures of Cadder Church, used Sunday by Sunday to receive the offering bags from the elders, is the bronze Alms-Dish. which is then laid on the Holy Table. "+ Presented to Cadder Parish Church + In memory of James Boyd of Glenhead + 5th March, 1929 +"
But the dish itself is up to 400 years or more older! At the Exhibition of Scottish History of 1911, gathered from all over Scotland, 15 such Alms-Dishes were exhibited. The City of Nuremberg, in South Germany, was the chief centre of their production during the 14th and 15th centuries. 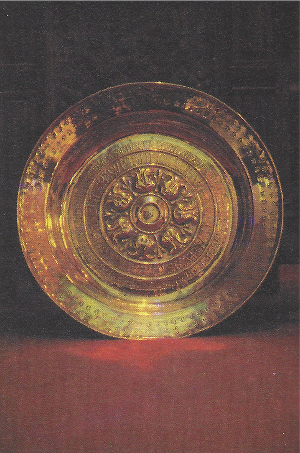 The Cadder Plate is a fine example, over 17" wide, although the design on the centre of the plate is symbolic rather than representational. Other plates in Scotland show a Garden of Eden scene; the Lamb and the Flag; or the return of the two spies from Eshcol (Numbers 13.23). There is a double circle of lettering on the Cadder Plate, but even when first made this, either through ignorance or design, was already meaningless in order to give a mysterious appearance to the work. The original phrase, repeated round the outer circle, seems to have been "Ich Warte der Zeit in Frieden" = "I bide the time in quietness" (Cf. Isaiah 30,15), But many of the letters are changed, jumbled or reversed. We have not been able to find any meaning in the letters in the inner circle. So the gentle mystery of our Alms-Dish remains unsolved. An elder of Cadder Church, who deserves at least a footnote on the wider page of world history, is Thomas Muir of Huntershill, who has been called "The Father of Scottish Democracy". Other descriptions are "Martyr", "Radical", "Agitator", "Patriot" and "Traitor". Obviously a man who roused strong emotions! Born in the High Street in Glasgow in 1765, he was the son of a successful merchant, James Muir, in turn the son of the tenant farmer of Hayston and Birdston Farms near Kirkintilloch. Later the father bought the small estate of Huntershill, in the parish of Cadder. 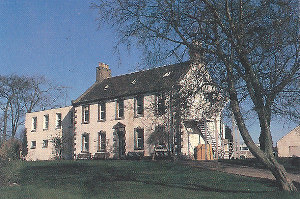 The house, built about 1770, stood just off the old Post Road to Edinburgh, now called Crowhill Road. Though no snob, Muir was proud of the title he could claim, Thomas Muir, Younger, of Huntershill. Muir was a devout Christian all his life, but from early studies of divinity turned to law and became an admired and energetic student leader in the political controversies of the 1780s. So much so that he was expelled from Glasgow University (he refused to apologize!) and completed his studies in Edinburgh. It was a time of democratic and constitutional unrest, following the American War of Independence, and with the French Revolution of 1789 breaking down in civil strife and violence. Muir the idealist campaigned for Reform, but the fear of revolution drove the authorities to harsh measures. He was singled out as a ring-leader, tried for sedition in Edinburgh in August 1793, and sentenced savagely to 14 years' transportation to Australia as a political prisoner. The country was astounded by the severity of the sentence, clearly a blow by the political establishment against "the spirit of discontent which still lurked in the minds of the people". The very extent of popular reaction prevented any clemency. Muir and the three men who reached Botany Bay with him in 1794 were the first political prisoners in the colony. He was to live there only until early 1796 when he escaped in an American trading ship, the "Otter". His round-the-world adventures are a book in themselves! Eventually he reached France in November 1797, a sick and wounded man, and died in January 1799. He was only 33. Within a generation the causes for which he had suffered were vindicated in parliamentary and electoral reform. The Reform Bill was passed in 1831. In 1844-1845 the so-called "Martyrs' Monument" was built in the old burial ground on Edinburgh's Calton Hill, to the memory of Muir and the four exiled with him, though few today recognize the familiar needle on Edinburgh's skyline. The brief radical career, and personal sufferings, of this onetime elder of Cadder Church provide one of the well-springs of our modern form of democratic government. For about 700 years Cadder Church served a large rural area, the old parish stretching from Bearsden to Stepps. The building of the main Edinburgh to Glasgow railway in 1842 marked the start of a transformation. The Rev. J.B.A. Watt (Dr. Graeme Miller's grandfather) was called to minister in Cadder in 1882. Among many vigorous initiatives, the Kirk Session Minutes of 6 January 1885 record: "The Moderator is authorized to procure further information as to a Hall at Bishopbridge (sic) and when convenient present a report to the Kirk Session,"
Mr. Watt must have continued his enquiries as the village of Bishopbriggs grew, but it is not until 18 January 1896 there is sudden and decisive action: "The Moderator gave a detailed statement of what had been done in connection with the Hall which it is proposed to erect at Bishopbriggs. The most interesting and important part of this intelligence was the prompt and liberal offer from the Lord of the Manor of a site at a nominal rate, and a donation of fifty pounds towards the building fund." And the Minute goes on to give the full text of the letter from the Victoria Barracks in Windsor of Archibald Stirling Esq. of Keir and Cawder. By 30 April 1896 the Kirk Session had before them "the Estimates for the Building of Church Hall". These totalled £939.10.7 "It was agreed to begin building operations forthwith and instructions were given accordingly". The Minutes of 12 January 1897 tell us that "the Church Hall at Bishopbriggs .... was declared to be now nearly finished .... opening services to be held early in February". When the bills were all gathered in the total cost was found (in September 1897) to be £1598.0.9. Receipts had been £1435 so the Kirk Session was responsible for the bank overdraft of £163! "A long felt want had been supplied in the chief centre of population in the Parish, and .... the Church of Scotland in this district is now fully equipped for the work to which she has been called." So the South Hall was built and with the superb extension of the early 1970s continues to serve the needs of church and community. Records show that Wm. Stirling, Schoolmaster and Session Clerk, taught from 1688-1729, giving 41 years of service, living only on the fees gleaned from pupils, with whom he had to live, In 1730 Chas. Paterson was paid 8/-d. for thatching the Schoolhouse, but its location is not known. 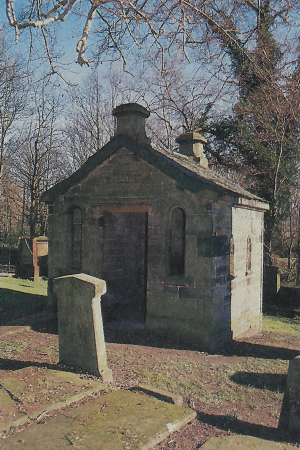 In 1790, a house was built in a corner of the graveyard for the Teacher Wm. Barclay - it was said to be near to "Barbara Pearies School". Wm. Paterson 1798-1803 resigned due to the poor condition of the house and this led eventually to the building of the new Schoolhouse which is still in use today as the Church Officer's house. Built in approx. 1830 "on the south side of the Canal" near to Gateside Well", the costs were not to exceed £100, and the schoolroom formed part of the ground floor accommodation in the house. An increase in pupils required the building of the school proper, which in turn had to be extended. By 1873 the school capacity was described as 149 pupils in 3 rooms - including the schoolroom inside the house. 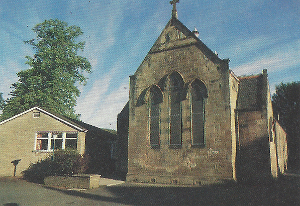 Changes in population eventually led to the closure of the school in 1980 and the Church was able to arrange a long lease with the current owners. 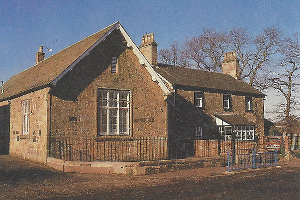 The 1983 project for the development of the old school as a suite of Halls, involved raising over £18,000 to cover contractors' work and materials. Thirty-five volunteers worked like slaves to make the transformation, renovating, refitting, painting, insulation, etc. Happily the project was completed on target and is now in use for a great variety of Church activities. The names of 16 Pre-Reformation Clergy of Cadder, and 17 further Sub-Deans of the Cathedral of Glasgow of which the Parish was a part, are known: a total of 33 men from 1266 to 1570. 22 ministers since the Reformation, a total of 55 men whose names we know who have ministered in this congregation in over 700 years.